Quite some time ago, I had a collection of items in a small cardboard box. They had no value at all and if I had allowed anyone to look in the box, they would just have seen a box of garbage. To me, it was a box of possibilities. I collected the items of over a period of years while I was delivering mail. The idea at the time was to write a short article or story about each item. It would be sort of an exercise in writing and imagination. I had pretty much forgotten about my box of stories until tonight. I just went through the box and I am more determined than ever to use each of these things to create a story. In the box there is a large black and orange polka dot bow tie that would look good on any circus clown. I remember picking this one up about twenty years ago. It caught my attention because it was lying on the sidewalk and it wasn’t any where close to Halloween. Halloween is the time you might expect to find parts of a clowns outfit, not mid June. I did have a couple of clowns that lived on my letter carrier walk, but they lived many blocks away and I have a feeling they would look make sure that no part of their uniform ended up on the sidewalk several blocks from their house. 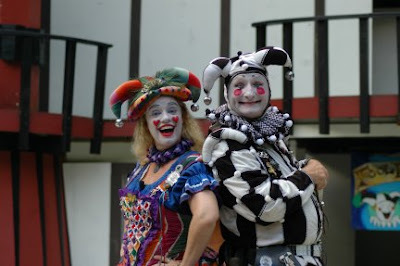 I met this couple when I had a registered letter for “Jo-Jo the Clown”. I knocked on the door and a young woman with a couple of pre school kids answered the door. I told her I had a registered letter for Jo-Jo the Clown and she said that was her husband. “Your husband is a clown?” I asked with a smirk on my face. She told me that they both were clowns and worked parties and festivals during the summer. Summer is the busy season, but she told me that until the kids were in school she could only work when her husband wasn’t. Of course I had all sorts of questions and lucky for me, Mrs. Jo-Jo was happy to be talking to someone over three feet tall. She got me a glass of water and we had a nice chat on the steps while the kids ran back and forth through the sprinkler. It turns out that Joe and Jessi (Bubbles) met at Clown College. They would probably have gone to the Ringling Bros. College, but I can’t remember if that’s true or not. Bubbles talked about being a clown and how much they loved their job. I did get the impression that it was indeed a job. Of course it is, but somehow, the inner “Ken” kind of wants clowns to be special people who have dedicated their lives to making kids laugh. Sometimes the things I want just can’t be. Over the next few years, I got to know Jo-Jo and Bubbles a little, as much as a mailman ever gets to know his customers. I watched their kids grow up and the family appeared to be nice, normal, middle class people. Well, if your definition of normal is wearing oversized shoes, face paint, baggy pants, a black and orange polka dot tie and a coat with pockets full of balloons to work. I often wonder if their kids decided to become clowns like their mom and dad when they grew up. Probably not, those would have been pretty big shoes to fill.